Theo Fages, who missed the fixtures against Catalans Dragons and Warrington Wolves, is named in head coach Justin Holbrook's 19-man squad for Good Friday's game at Wigan. The French international half back had been absent since picking up a hip injury in the win over Hull KR last month. Jack Ashworth is the man that drops out. Wigan aptain Sean O’Loughlin, Ben Flower and Joe Greenwood are all made available for the Warriors after missing out last week. O'Loughlin and Flower were expected to return and the inclusion of Greenwood shows he has passed concussion protocols. Thomas Leuluai has recovered from a calf strain. Tony Clubb, Liam Marshall, Jarrod Sammut and Liam Farrell remain on the comeback trail. Dom Manfredi is also sidelined and Sam Powell begins his two-game suspension. St.Helens 19 man squad: 1. Jonny Lomax, 2. Tommy Makinson, 3. Kevin Naiqama, 4. Mark Percival, 5. Regan Grace, 6. Theo Fages, 7. Danny Richardson, 8. Alex Walmsley, 9. James Roby, 10. Luke Thompson, 11. Zeb Taia, 12. Joseph Paulo, 13. Louie McCarthy-Scarsbrook 15. Morgan Knowles, 16. Kyle Amor, 17. Dom Peyroux, 19. Matty Lees, 21. Aaron Smith, 23. Lachlan Coote. Wigan Warriors' 19-man squad: Joe Bullock, Joe Burgess, Tom Davies, Morgan Escare, Ben Flower, Oliver Gildart, Joe Greenwood, Chris Hankinson, Zak Hardaker, Willie Isa, Tommy Leuluai, Romain Navarrete, Sean O’Loughlin, Oliver Partington, Dan Sarginson, Jake Shorrocks, Morgan Smithies, Taulima Tautai, George Williams. 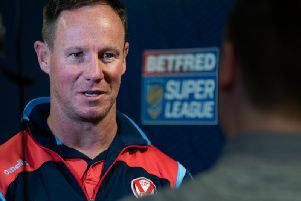 St Helens coach Justin Holbrook says Wigan Warriors as "dangerous as anyone"